Dave and I are suckers for a good “weekly ritual.” In the first few years of our relationship, every single Sunday was pizza night. All of our friends and family even knew about it. Yet, once we moved to San Francisco, we turned that Sunday night into taco night. Well, the tides have turned again, because we’ve been back on a pizza kick as of late. And it feels good to be back. Because we tend to go out to dinner on Saturday nights, Sunday nights are our official “date-nights” at home. We’ve been doing them for so long that we have a routine down. It’s a special time that we can be excited about each week, even though it means the weekend is just about over. And knowing you always have pizza on Sunday night, well that’s something to look forward to in itself. Sometimes we like to eat our pizza at the coffee table on the floor. Why? Just feels fun. Having a special night at home doesn’t have to be expensive and is something you can enjoy with your significant other any time. I’m a big fan of nights at home now more than ever because we have our little puppy and want to stay home as much as possible to keep him company. Music. Turn it on. But not too loud, so you can have some conversation over it. Our favorite stations for date-night on Pandora include the Frank Sinatra station and the Michael Buble station, yet the real winner is by far the Olive Garden station. We put the music on the TV in the living room, so it spreads throughout the house. Candles. That goes without saying, right? But you don’t just want to put candles at the table, you also want to have a scented candle going when you’re in the kitchen and hanging out. I love vanilla, cinnamon and warm scents. Pajamas. I don’t know about you, but I can’t relax at home if I’m not in my comfortable clothes. In order to enjoy myself during our date-nights at home, I like to wash my face, pull my hair back and slip into some loose and comfy attire, which easily transitions to laying on the couch to watch TV. Nothing fancy around these parts. It’s just not my thing. Wine. Because, wine. I only ever drink wine on the weekends, so Sunday night is my final night before the week begins to un-wind with a nice glass. On date-nights, Dave and I open a bottle of red wine to enjoy alongside our meal. And it’s also a night when I like to pull out the nicer wine glasses, once again, just because. Games and activities. We’re both a little competitive, so we like to sit around the coffee table and enjoy Scrabble on many nights at home. And yes, we often make a wager. Other games that are fun to play? Yahtzee, trivia and even cards. Conversation. True story: I think we have our best conversations while sitting at the table, because all distractions are put aside. Yet, before we even get to the table, sometimes I pull out my handy “The Book of Questions ” by Gregory Stock just for a little extra. And that’s always a great dialogue. If you don’t own that book, get it now! I’ve even brought that out for family nights in Florida and you wouldn’t believe the things those questions get people to talk about. A show. Whether you have a TV show that you watch together or a movie lined up, the best thing to do once the food and table is cleaned up, is to plop on the couch and relax with some entertainment. Right now, we’re watching season 3 of “Orange Is The New Black” on Netflix, so that’s been keeping us occupied on nights at home, snuggled up with our little pupster. I’m being totally honest when I say that we’ve tried nearly every brand of oven pizza over the years, and many are not good. Yet these pizzas are good, otherwise I would not have wanted to share them with you. On Sunday night, we made two pizzas side-by-side in the oven. Don’t mind my jorts, but I hadn’t changed into my “comfortables” yet after a day out at the fair. The crust of these pizzeria! thin Pizzas is the best. It’s thin and crispy and drizzled with olive oil, so it has the perfect, taste, texture and consistency. And also, it’s preservative-free, which is always a good thing. 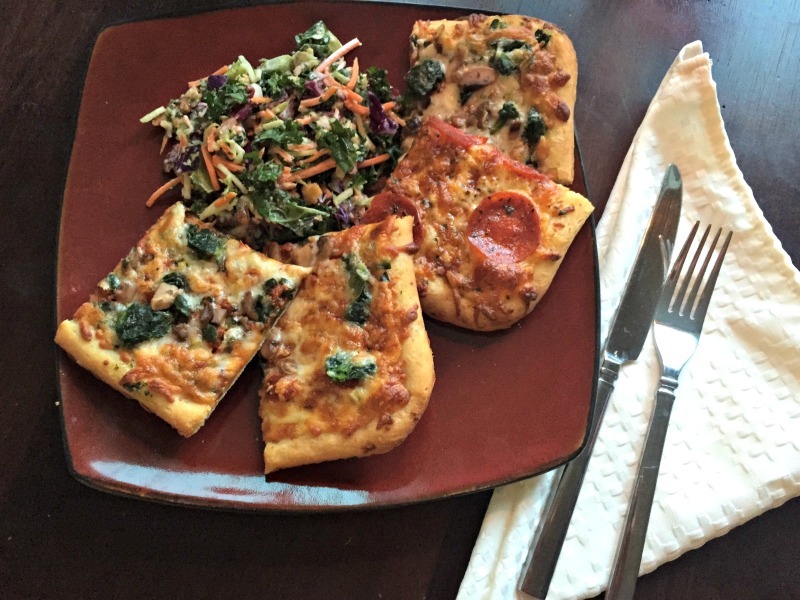 In addition, these pizzas have no artificial flavors and are very easy to cook. Preheat your oven to 375 degrees. Place the pizza directly on the center rack and bake for about 15-17 minutes. Pull it out of the oven to cool for about five minutes before you dig in. Enjoy. You can find four flavors of the DIGIORNO pizzeria! thin line available in stores now, including Primo Pepperoni, Spinach & Mushroom (totally my personal favorite), Margherita and Supreme Speciale. While I loved them all, I was a major fan of the Spinach & Mushroom, because I do like that combination on my pizza. Mushrooms and veggies make me happy. My plate from our most recent date-night featured some mixed kale salad, three slices of the Spinach & Mushroom and a slice of the Primo Pepperoni. What a good meal, prepared in a flash. And yes, I even pulled out the cloth napkins. Nutrition-wise: 1/4 of the pizza has 310 calories, 15 grams of protein and about 25 percent of your daily calcium, which is not too shabby for a dinner. Suffice to say, Dave and I thoroughly enjoyed our date-night with these pizzas, and I think they will be making another appearance again soon. 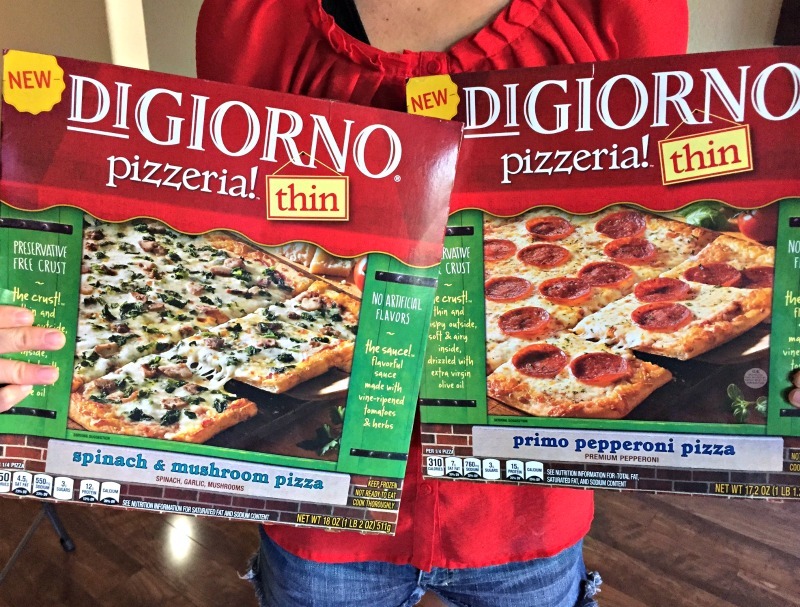 And by the way, DIGIORNO is so excited about this new line that the company is encouraging anyone who tries it to share their feedback and pictures using #YouBeTheJudge on the DIGIORNO Facebook or Twitter page. So if you pick one up, make sure you do that. But limit your time on social media during your date-night, folks. Be present. Please note: I was selected for this opportunity as a member of Clever Girls, and the content and opinions expressed here are all my own. Do you have a weekly ritual? What’s the perfect “date-night” in for you? I love date nights at home for the comfortable clothes alone 🙂 It’s fun to get dressed up, but I love being nice and comfy on the couch. Me too, Heather! Even though I spend all my day in workout clothes, I still find pajamas more comfortable hehe! 🙂 Happy Thursday, lady! Alex and I are all about the board games and pizza and a beer, or I’ll have fun and make a creative dinner. But really, it is about turning that tv off and finding a way to just enjoy each other’s company with good (or even frivolous) conversation. Now, if he could just not work so hard, that would be lovely! Hi Susie! So you’re a board game-nerd too? We love a good game. And yes, the majority of the night, the TV should be OFF. But I don’t mind it being on once much of the quality time is done heheh. 🙂 Alex needs a vacay! You can always have pizza-for-one, Megan! That means you get to choose the topping and flavor hehe. Happy Thursday, lady! Our favorite date nights at home always included wine and a movie. We loved to snuggle up on the couch together and just relax. Now that we have a toddler, we almost never have date nights at home. I love date nights at home! It’s usually a red box movie and ice cream on the couch for us. However, with 3 kids running around it’s sometimes better to just go out so we can have some peace! My favorite pizza topping is any kind of cheese – blue cheese, gorgonzola, anything! However, my favorite pizza is a truffle mushroom pizza. My friend got me some amazing truffle oil from San Francisco and it makes that truffle mushroom pizza. Also, some good truffle salt! I found some in a little shop in Williamsburg – tiny jar for $25! My husband couldn’t believe I was serious about buying salt for $25. But, as soon as we got it home and put it on the pizza he was sold. Definitely getting that Book of Questions! Thanks! We ate at a restaurant in Williamsburg once called Food For Thought. Besides having amazing food, they had little cards on the table with different questions that you would ask your dinner partners. It was cool! Hi Melissa, Oh cool, that “Food For Thought” restaurant sounds like so much fun. Sort of like how Cracker Barrel has that peg game to keep you entertained before you yet? hahah. But I do like asking questions, and you’ll enjoy “The Book of Questions” for sure. As far as truffle oil and salt, I have had the pleasure of trying them both, so I know they are worth the spend. But yes, the price is shocking hehehe. 🙂 Happy Thursday!! Yay for pizza! You included some of my favorite things in this post- wine, pajamas, and pizza. All while at home relaxing:) Sounds like this perfect kind night to me! I am well! I’ve been away in Maine. I went to Wells, York, Kennebunk Port, Portland and Freeport! I loved it! I remember you saying your husband was from Maine. It’s so breathtakingly beautiful there. There were some excellent ideas in here. Great job! Thanks, Heather! 🙂 hope you have a nice date-night at home soon! Yay for at home date night. Dave and I were going to ️yoga together as our casual date night but that’s been tough with our schedule lately. We do try to go for walks though. Pretty sure he would jump for joy for pizza night together. Love these ideas! I had no idea there was an Olive Garden Pandora station, haha. Adding to my weekly lineup immediately. Ummm it’s SO awesome. I LOVE that station. It just screams romantic and relaxed hehe:) Enjoy. Love this post! Between pure laziness, a little boy, and trying not to spend all of our money (haha) date nights in after bed time are a necessity. Love these date night suggestions!!! And yes, I must be in my pajamas at home. I always feel like I should at least be semi dressed up for at home date night, but forget it! We’ve never lit candles before, I like that suggestion. I also think it’s great to plan what you will watch in advance so you don’t ruin the fun by having to search for shows or a movie…classic haha. Have a great 4th!! Love this! 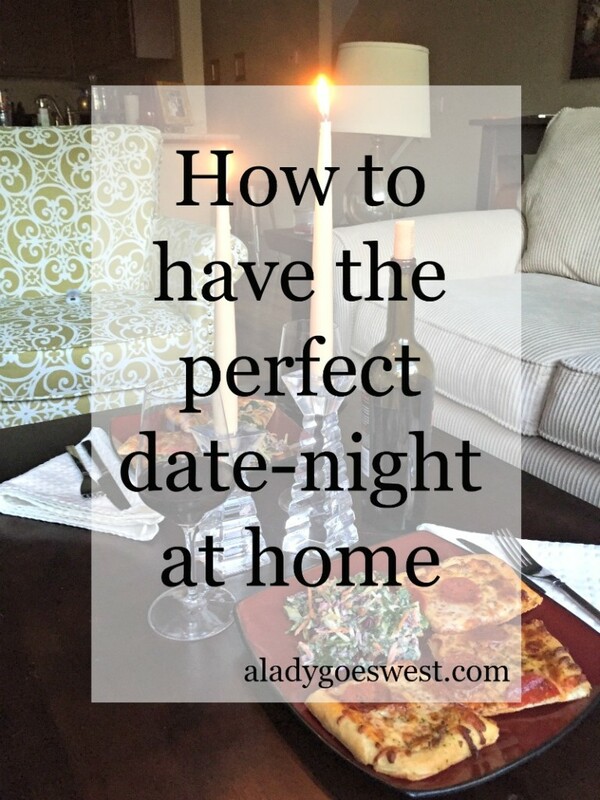 Since we have young kids, we almost always have date nights at home… which is fine with us! We love sitting at home with a good movie and snuggling up! Hi Lauren! That’s great. As long as you’re with the person you want to be hanging out with, it doesn’t matter where you are. 🙂 Happy Thursday, lady! Great tips! Scott and I like to do date nights at home too. We try to make it a little formal and I hold off putting on my “sleep clothes” as he calls them until we call an end to the date! My favorite pizza topping is probably veggies. All kinds! 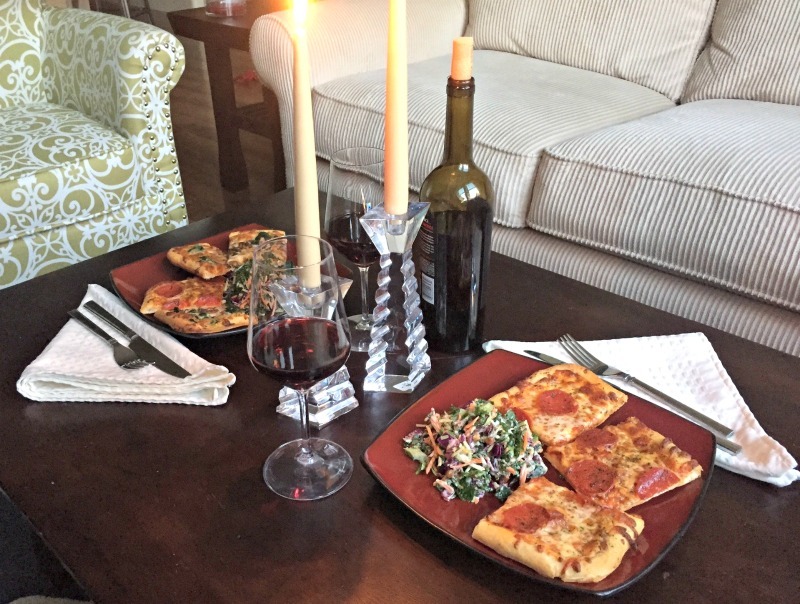 I love how you incorporated the pizza post with date night ideas. Sometimes sponsored posts can feel very, well, sponsored. This one just makes me hungry! I’m going to plan an at home date night soon with your fun ideas. Our go to game, Scattergories! Rebecca West recently posted…Have you heard about the Cricut Explore? Wine and conversation are always a must on our date nights! This is a great list! Thank you for sharing!!! What a sweet tradition, Ashley! I’m hoping to settle into a nice routine like that. And I love the idea of eating pizza from the coffee table! This is such a cute post! I love date nights at home. I’ve never heard of the “Olive Garden Station” on Pandora…sweet, I’m on it! I love playing music like that when I’m cooking too…it’s so relaxing. Keep up those dates nights, they’re so important and create the best memories. Hi Tia! I so agree with you! Thanks for saying hi, and YES you need to listen to the OG station. 🙂 Have a wonderful evening! You guys are so cute. Chocolate covered dates… where do I find those? Do you make them yourself? Hi Cassie! Safeway has coconut and caramel-covered dates in the produce section, usually under the apples. I add the chocolate myself. 🙂 Yummmmmmmy stuff! Going out is fun but sometimes the best visits with friends and family can happen at home. The relaxed vibe is often more enjoyable. Have you had the frozen pizza by Full of Life? It is a flatbread pizza that I found at Whole Foods. It is made in California and I tried it for the first time the other night. Found out am moving to Southern California next month and thought it would be a fun way to celebrate! Our idea of date night is usually kicking back and chillin on the sofa together late into the evening on a Friday night and watching a good movie on Apple TV or Real Time on HBO. With kids we try to steal away time and do these date nights but we have to push back the start time until our boys are sleeping. It’s not every Friday but we do it as much as schedules allow. One great part of our date night is sharing some ice cream together. Bottom line, I enjoy time at home together and making dinner together in my own kitchen more than heading out to a restaurant. Hi Sonia! Yes, I’m sure date night is better once the kids are down to bed! And ice cream sharing? A very nice activity to do together. 🙂 Thanks for sharing hi, lady! Hope you had a nice weekend!